Huggo's On The Rocks | Kailua Kona Casual DiningSuper Bowl Bash at On the Rocks! Super Bowl Bash at On the Rocks! 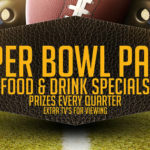 Itʻs Super Bowl time again at On the Rocks! There will also be PRIZES, & GIVEAWAYS! One of the special prizes will be ½ day fishing charter on Linda SUE II…….Captained by Jeff Heinz!! Come down early to get your spot and while youʻre at it, keep an eye out for whales & dolphins out in the bay!